Nat King Cole with his second trio featuring Johnny Miller, bass and Oscar Moore, guitar. Nat King Cole was not the first, nor would he be the last, jazz artist whose success as pop singer nearly eclipsed his brilliance as instrumentalist. Consider Louis Armstrong and, a generation later, George Benson, just to name two prominent examples. Cole, who died of cancer in February 1965, barely a month before his 49th birthday, was a best-selling singer and global pop star. Unbeknownst to many of his fans then and now, he was also one of the great pianists in jazz history. His tight swing, fluid runs, and economic-but-elegant voicings became an influence on pianists as diverse as Art Tatum (whose trio was inspired by Cole’s), Ahmad Jamal, Bill Evans, and Oscar Peterson (to the point that reportedly Cole once mistook Peterson for himself on a blindfold test). His recordings with Norman Granz stand as classics. (Check for his 1942 sessions with Lester Young.) And his unusual trio — piano, bass, and electric guitar — which he led from 1937 to, roughly, 1951, set standards for small combos in jazz. 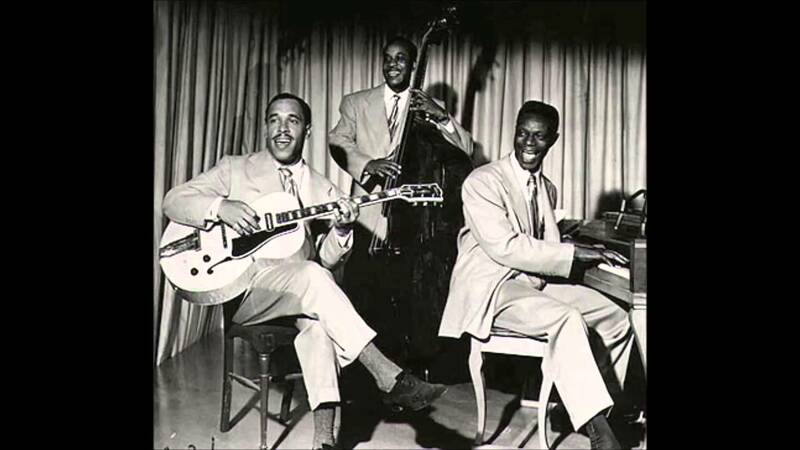 The King Cole Trio swung hard yet, seemingly, effortlessly and was a model at balancing individuality and ensemble playing. As part of their set and, “to break the monotony,” as Cole once put it, the pianist and leader also sang a couple of tunes. But he quickly understood that trying to reach a wider audience meant, plainly, “More singing, less playing.” Cole knew he was dealing with what he exasperatedly called “dog tunes,” but the artist was also a husband and father — and an eminently practical man. Jazz’s loss was pop’s gain. He stood up from the piano and sang, and singing became Cole’s career. And what a career it was. He had a rich, warm, smooth voice of limited range but extraordinary expressiveness. He also had impeccable diction and a talent for storytelling capable of making even some of the most inane novelty tunes of the day listenable, if not believable. (And he turned a few of them into hits.) He also had a presence — the smile, the mysterious almond-shaped eyes, and the gentlemanly demeanor. It made Cole an international star. The Collectors’ Choice reissues from his Capitol catalog (beginning in 1955 to his posthumous, 1965 collection Looking Back) catch Cole at the height of his powers. He’s in fine form as vocalist, is working with top arrangers (Nelson Riddle, Billy May, Gordon Jenkins), secure enough to explore (his much-maligned but enormously popular country albums), and reach out to new audiences (his albums En Español). And he even has the muscle to indulge, to a degree, his first love (the piano), as well as jazz fans (Penthouse Serenade (1955)/The Piano Style of Nat King Cole (1956). The twofers have smartly been put together thematically, or by pairing discs by the same arranger. Cole remains unmistakably himself, but different arrangers bring up different qualities in his singing — which was precisely Cole’s point, says producer James Ritz. Time and again, Riddle finds an engaging balance between swing and romantic pop, strings and all. (Listen to the setting he offers Cole in “There Will Never Be Another You.”) On the instrumental albums, Riddle sets Cole’s piano to large ensembles and string orchestras and the overall effect, reinforced by Cole’s straight-up reading of the material, is closer to instrumental pop than jazz. (For a more satisfying “late” Cole playing jazz seek After Midnight, which is not included in this set because it’s still available elsewhere.) What you get on these albums is just a hint of Cole the pianist. But then, by the time of The Piano Style of Nat King Cole,” the jazz pianist was a major pop star.